James Emory Foxx (October 22, 1907 – July 21, 1967) was an American first baseman in Major League Baseball who is widely regarded as one of the greatest right-handed power hitters to ever play the sport. Foxx was the second major league player to hit 500 career home runs, and, at 32 years, 336 days old, is still the youngest ever to reach that mark. Foxx was inducted into the National Baseball Hall of Fame in 1951. Nicknamed "Double X" and "The Beast" by the press, stories of Foxx's powerful blasts existed in almost every American League park. He once hit a ball thrown by Vernon Gomez of the Yankees into the upper left-field stands of Yankee Stadium. The ball broke a seat in the next-to-last row, just to the left of the bullpen area. In later years, when asked about the blast, Gomez said, "When Neil Armstrong set foot on the moon, he found a baseball that Jimmie Foxx hit off me in 1937." Born in Sudlersville, Maryland, to Samuel Dell and Martha, Jimmie’s parents were tenant farmers. His work on the farm would help him to build up the body strength that made his swing legendary. Foxx attempted to join the army at the age of 10, allegedly trying to emulate his grandfather, who was a Civil War veteran. Turned down by the army, he participated in athletics in school and excelled at track and field, setting several local records in track as well as baseball. In his junior year, at the age of 16, Foxx was invited to tryout for the Easton team of the Eastern Shore League by player-manager, and future National Baseball Hall of Famer, Frank "Home Run" Baker. Foxx impressed Baker with his ability and his willingness to play catcher, even though it wasn’t his original position. He signed for a salary estimated between $125-$250 a month and played for the Easton team during the summer of 1924. He went back for his senior year, but left in the winter to attend spring training with the Athletics and never graduated. Foxx’s .296 batting average and 10 home runs for the Easton team caught the attention of Connie Mack, manager of the Philadelphia Athletics and former boss of Frank Baker. Based on Baker's recommendation, Mack and the Athletics (A's) bought Foxx’s contract from Easton. Foxx would train with the Athletics through the end of 1924, and would eventually make his Major League debut on May 1, 1925. Foxx’s early years with the Philadelphia organization started with playing time in their minor league system and some sparse playing time with the major league team. The A's catching duties were already capably filled by future Hall of Famer Mickey Cochrane, so by 1927, Foxx was splitting time between catching, first base, and the outfield. In 1927, Foxx would play in 37 games. This was a significant year for him, in that a majority of his playing time was at first base, where he would play the remainder of his career. Foxx became a regular in 1928, playing first and third, and finished the year with a .328 average. His A's came in second to the New York Yankees, but he was by then a rising star. In the off-season, he celebrated his first year as a regular by buying his parents a new farm outside Sudlersville, and by eloping with Helen Heite. They would have two sons during their fourteen-year marriage. In 1929, finally starting and installed as the A's regular first baseman, Foxx had his breakthrough year, batting .354 and hitting 33 home runs. He would help lead the Athletics to win the American League Pennant and defeat the Chicago Cubs in the 1929 World Series. This would be the first of three straight World Series appearances for the Athletics. They would also win in 1930 and lose in 1931. In 1932, Foxx hit 58 home runs, which stood as the single-season record for a right-handed batter for 66 years, until Mark McGwire hit 70 in 1998. He followed up in 1933, by winning the Triple Crown with a batting average of .356, 163 RBIs, and 48 home runs. He won back-to-back MVP honors in 1932 and 1933. When the Great Depression fully hit in the early 1930s, A's owner Connie Mack was unable to pay the salaries of his highly paid stars and was obliged to sell off a number of them, including the great pitcher Lefty Grove. In 1936, Mack sold Foxx's contract to the Boston Red Sox for $150,000, following a contract dispute. Foxx played six years in Boston, including a spectacular 1938 season in which he hit 50 home runs, drove in 175 runs, batted .349, won his third MVP award, and narrowly missed winning the Triple Crown. In 1939, he hit .360, his second all-time best annual batting average. His 50 home runs would remain the single-season record for the Red Sox until David Ortiz hit 54 in 2006. Foxx's skills diminished significantly after 1941. Some sources attribute this to alcoholism, while others attribute it to a sinus condition. His sinus condition was the result of a pitch thrown by minor leaguer Barney Brown in an exhibition game held in Winnipeg in 1941. It struck Foxx on the forehead and knocked him unconscious. He spent four days in the hospital and suffered from sinus problems for the rest of his life. He split the 1942 season between the Red Sox and Chicago Cubs, playing mostly a reserve role. He sat out the 1943 season and appeared only in 15 games in 1944, mostly as a pinch hitter. He wound up his career with the Philadelphia Phillies in 1945 as a jack of all trades, filling in at first and third, pinch hitting, and even pitching nine games, compiling a surprising 1-0 record and 1.59 ERA over 22 2/3 innings. An interesting historical sidelight is the fact that throughout his career he was often called the right-handed Babe Ruth and ended his big-league career as a pitcher, while Ruth began his big-league career as a pitcher. After his playing career was over, Foxx had some financial troubles. He worked in the Red Sox radio broadcast booth in 1946, but a series of bad investments left him broke by 1958. He worked as a minor league manager and coach after his playing days ended, including managing the Fort Wayne (Indiana) Daisies of the All-American Girls Professional Baseball League. Tom Hanks' character, Jimmy Dugan, in the movie A League of Their Own was largely based on Foxx, but the producers took a number of liberties in creating the role. After many attempts to gain employment in baseball, Foxx became disillusioned with baseball and wrote an article in the May 1962 issue of Baseball Monthly saying: "Baseball doesn’t want guys like me … Baseball has no room for fellows who built up a lot of prestige as ballplayers. What management wants today is the young executive-type manager. Baseball managing and coaching is a young man’s field and old-timers might as well accept the fact. General managers don’t want to be bothered by old men, regardless of their earlier contributions to the game as players." Foxx died at age 59 in Miami, Florida, apparently by choking to death while eating dinner at his brother's home (similar to the way his wife choked and died several months earlier). He is buried at Flagler Memorial Park in Miami, Florida. A statue of Foxx was erected in his hometown on October 25, 1997. Jimmie Foxx finished his 20-year, 2317-game career with 534 home runs, 1922 runs batted in, and a .325 batting average. He won a total of three MVP awards. His 12 consecutive seasons with 30 or more home runs was a major league record that wasn't broken until 2004, by Barry Bonds. 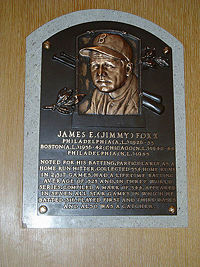 He was inducted into the Baseball Hall of Fame in 1951, wearing a Red Sox cap. At the end of his career, his 534 home runs placed him second only to Babe Ruth on the all-time list, and first among right-handed hitters. He retained these positions until Willie Mays passed Foxx for second place on the all-time home run list in 1966. Foxx is currently fourteenth on the all-time HR list. Foxx was one of the three or four most feared sluggers of his era. The great Yankee pitcher Lefty Gomez once said of him, "He has muscles in his hair." In 1937, Foxx hit a ball into the third deck of the left-field stands at Yankee Stadium in New York, a very rare feat because of the distance and the angle of the stands. Gomez was the pitcher who gave it up, and when asked how far it went, he said, "I don't know, but I do know it took somebody 45 minutes to go up there and get it back." In 1999, he ranked number 15 on The Sporting News list of the 100 Greatest Baseball Players, and was a nominee for the Major League Baseball All-Century Team. On September 21, 2006, David Ortiz hit home runs 51 and 52, passing Foxx for most home runs in a single season by a Red Sox hitter. The Jimmy Foxx Memorial Statue was erected in 1997, by the Sudlersville Community Betterment Club. The life-size bronze statue joined a stone memorial dedicated in 1987. ↑ Baseball Reference Online, Jimmy Foxx. Retrieved June 20, 2007. ↑ Creative Quotations, Baseball: Quote for the Day. Retrieved June 28, 2007. ↑ Jimmie Foxx, "I’m Through with Baseball Forever," Baseball Monthly (1962), p. 211. ↑ Major League Baseball, Official Website. Retrieved June 20, 2007. Baseball Library. Jimmie Foxx. Retrieved June 20, 2007. Bennett, John. The Baseball Biography Project. Retrieved June 20, 2007. Major League Baseball. Official Website. Retrieved June 20, 2007. New York Times Obituary Baseball-almanac.com. This page was last modified on 7 May 2018, at 22:46.